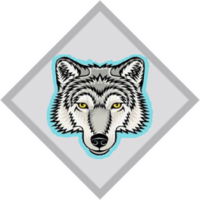 Once you are invested as a Cub, you will work towards your Silver Wolf badge. Along the way to the Silver Wolf you will earn four challenge awards: the Awareness Challenge (Green Paw), Community Challenge (Yellow Paw), Outdoor Challenge (Blue Paw), and Aptitude Challenge (Red Paw), and you will earn a badge for each of these. Completing the Silver Wolf should take about 1½ to 2 years. After Silver Wolf, you will start on your Gold Wolf badge. Show that you are doing your best while playing games and activities during pack meetings. Show that you understand how to look after yourself when you are outdoors and active on a sunny day. Throw a ball to somebody else, and catch it again eight times out of ten. Dribble a soccer ball and shoot a goal OR hit a ball with a bat, three times out of six bowls. Learn to ride a bike and ride 100m. Learn to swim and be able to do a duck dive. Explain the importance of washing your hands before handling food, before eating, and after using the washroom. Know and understand the importance of good eating habits. Show that you understand why you should keep your body, hands, nails and teeth clean. Know the story of Kim. Play sense training games involving memory and feel and achieve a 70% score. Take part in a memory game with your Pack. Write and decipher a simple code. As part of a Pack activity outdoors, show that you know and practise the Outdoor Code. Make an item using natural materials. Grow a seed (pea, bean, mealie or bulb) in a transparent container. When it is big enough plant it in soil. Explain to a Pack Scouter what conservation means. Name three natural resources which are important to conserve. Show a Pack Scouter how you can help to conserve them. Find out three things that can cause water pollution and show how you could possibly undo pollution in water. Demonstrate how clean or dirty the water is that you use. Demonstrate how clean or dirty the air is that you use. Make a pooter to examine insects. Make a water scope to observe life underwater. Keep a diary of good turns for a week showing how you have helped other people. Keep your room or living area tidy for at least one month. Do something special to help a Leader during a pack meeting or activity. Make a gift and give it to a friend or family member. Sing three campfire songs with others at a campfire. Participate in traditional dancing, a jungle dance or rhythmic body exercises. Take part in a play-acting activity with your Six. Take part in a joint Pack meeting with another Pack. Learn to say hello, goodbye and thank-you in another language and teach them to your Leader/Pack. Take part in a cultural activity with your Pack. Learn about fire safety and show the correct way to strike a match. Lay and light a cooking fire and successfully boil a mug (or similar) of water. Using an alternate fuel source, show how it can be used to heat up soup (or similar). Spend a day with older Cubs on a Cub camp. Go on a nature ramble with your Pack. Listen to and identify sounds. Look for and identify, if possible, some interesting natural objects. Attend at least two outdoor outings with your Pack, District or Region. With a Scouter, go outdoors and point out where the sun rises, the path it travels and where it sets. Know the eight main points of the compass. Identify a simple object viewed from the side and top to illustrate the difference in shape. Draw a simple map of your home or meeting place showing the different rooms and doorways. Know how to make and recognise at least ten woodcraft signs. Know how to hank a short rope. Successfully take part in three separate games and/or activities which involve using knots. Behave correctly during all ceremonies and during the singing of national anthems. Learn the words of the national anthem and sing it together with other Cubs. Draw and colour the South African flag. Show that you respect your uniform and understand the importance of wearing it. Know the names and characters of eight animals from the Jungle Book. Know the safety rules to follow when in or near water. Explain the dangers of swimming in the type of water found in your area. Know the common causes of accidents in the home. Know what to do in the case of accidents at home or at your pack meeting place. Carry a message and deliver it politely and correctly. Show that you know the basic rules of the road as a pedestrian. Explain the dangers of talking to strangers. Know the importance of saying "NO" to any adult who wants to do something that makes you feel uncomfortable. Know what to do when you are alone at home. Know the importance of summoning adult help in the case of accidents. Show how to treat a simple cut and graze. Make a simple emergency kit and know how to use it. Use your scarf or a triangular bandage as an arm sling. Show how to tell the time and demonstrate the importance of being punctual. Be able to say the Cub Prayer. Show that you are keeping your Promise & Law and that you have a growing understanding of your duty to God and your duty to your country. To acquire and practise skills in specific areas; to explore and develop new hobbies. This page was last modified on 4 February 2019, at 08:46.